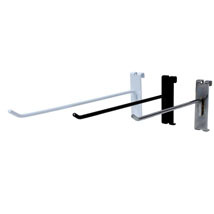 Display a wide assortment of products on these high-quality peg hooks! These chrome peg hooks for 3 in. grid are available in 2, 4, 6, 8, 10 and 12 inch lengths. These peg hooks will work on the 3 in. on center grid panel. Peg hook thickness is .228 in. For even more offerings, we encourage you to make time to shop our extensive array of peg hooks for grid at Specialty Store Services today.